You are currently browsing the archives for the Just for lolz. category. 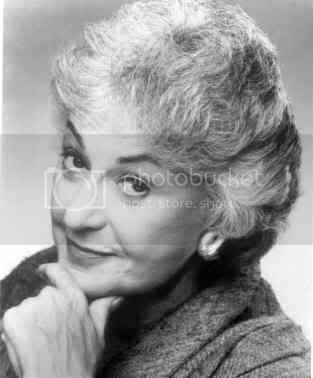 Of course, she was referring to the lovely, beautiful Bea Arthur. Boy, oh, boy. My foot is killing me. I bought a new pair of running shoes on Saturday and some insoles to go with them. To break them in, I decided to go on a nice long run yesterday. I did 4.5 miles, but about halfway through, I couldn’t feel my feet anymore. By four miles, they were screaming. I really hope it’s the insoles I got with them. They have a really high heel, which I think was putting more pressure on the balls of my foot. Since that’s exactly where my regular insoles are designed to take the pressure off, that’s probably why my right foot is still on fire this morning. I’m going to lay off it for the rest of the day and probably not run tonight. It’s my day to lift anyway. I’m probably going to suspend the running and lifting altogether Wednesday or Thursday. I’ve got a big day on Saturday and I don’t want to strain anything or risk any injuries. I’m in the best shape of my life right now, taking into consideration I’m almost thirty years old. (God help me.) Still, I have no idea how I’ll do. I’m pretty confident I won’t have a problem, but there’s still nagging doubts. I’ve got butterflies right now just thinking about it. I have to remember that everything that has brought me to this point appears to have been pre-ordained. Every time I’ve thought about not going through with it or examining other options, God slams those doors shut and gently brings me back onto this road, like a shepherd guiding a sheep along the path. “Stop trying to wander. Stay on the road upon which I’ve placed you and see this through.” I have to believe that if He has worked the circumstances to bring me to this point, He’ll help me rock it. If you want the cliche, “If He brings you to it, He’ll bring you through it.” It’s campy, but it works. So a few weeks ago, I had not shaven for a few days and decided I would let it go until my wife called me on it. By the time she complained, I was sporting a respectable beard. It was still young, but established, so I continued to grow it. Last night, I augmented it; partly to tick her off over an argument earlier yesterday evening, and partly just for fun. I shaved just one razor’s stripe down my chin, resulting in some odd pseudo-redneck-fu-manchu. The results were exactly what I was looking for. She was ticked, and I looked awesome. By Kati’s bedtime tonight, Leigh Ann put her foot down and told me she wouldn’t be seen in public with me until I shaved “that stupid beard”. So, I acquiesced. Kinda. I promptly went over to the sink and began shaving. Little did she know, I was only unleashing the full power of the fu. Now, my awesomeness is impossible to calculate or comprehend.